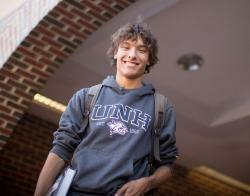 Immerse yourself in the fine arts through the studio art major at UNH. You’ll have the opportunity to develop your skills practicing two-and three-dimensional art forms that range from drawing, painting and photography to ceramics, sculpture and furniture design. You’ll gain a wide breadth of studio experience while also studying art history, writing and language to build a solid foundation in the liberal arts. With a degree in studio art, you’ll be prepared for careers in the arts or further study in graduate programs as varied as architecture, business and law. 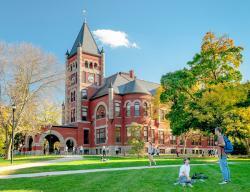 Why study studio art at UNH? With the UNH Museum of Art and Paul Creative Arts Center right on campus, the culturally rich community of Portsmouth just minutes away, and the fine art museums of Boston within an hour’s drive, you’ll be surrounded by dynamic art events and exhibits. You’ll meet and learn from artists and historians from around the world through our Visiting Artists & Art Historians program. A double major in studio art and art history also is available. The B.A. in Art - Studio Art option provides a strong fine arts education and solid foundation that prepares students for a life in the arts, whether it be as a professional or commercial artist, a teacher, an architect, a designer, or a museum director. We offer courses in painting, drawing, photography (both digital and wet lab techniques), printmaking, sculpture (all media: steel, aluminum, bronze casting, clay, and wood), furniture design and fabrication, ceramics, and design. A degree in Studio Art provides a foundation for diverse professional achievement. While these courses represent the minimum departmental requirements for the studio art option, students may wish to plan a program involving greater depth in one or several of the studio areas. The Discovery Program capstone requirement may be fulfilled by completing a 600 level or above course in the studio concentration. The student will work with the course's instructor to complete a mutually agreed upon capstone project associated with the course's medium. Studio art majors may use one major-required course to satisfy one Discovery category requirement. The two-dimensional curriculum is the largest in the department, and its breadth and content are shaped by the variety of approaches and expertise of the faculty. The 2-D courses are based on solid basic training and on the encouragement of independent and personal expression. Figuration and still life drawing are the core of the program. After completing Introductory Drawing, students pursue a wide variety of course offerings, choosing from oil painting, water media, photography, printmaking, and advanced drawing. 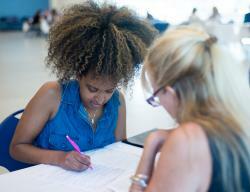 Students work in classroom studios and participate in group critiques and seminars. Towards the end of the four year curriculum, individual works receive increasingly detailed review and critique. Students are taught to methodically evaluate their own and other students work. North light and clerestory windows for even light distribution throughout the day illuminate the large, open studios. Class size varies, and upper level studio enrollment is usually about 15 students per class. Easels, drawing benches, and models are provided. Student works are exhibited in the corridors of the art wing of the Paul Creative Arts Center. The three-dimensional curriculum offers concentrations in sculpture, ceramics, woodworking, and furniture design. While each of these programs has a distinct curriculum, together they interrelate to form a comprehensive area. Teaching is highly individualized, enabling students to understand and develop their own styles while learning the aesthetic principles and technical skills involved in class projects. Assignments are based on contemporary issues but always develop from a sound historical perspective. Class size is kept small to provide structured, personal instruction. Full time technical assistants and student fellows who provide further instruction and technical help outside of class assist professors. The sculpture studio offers a complete bronze foundry, fabrication tools, equipment for work in wood and metal, gas and electric welding, a carving facility for wood and stone, hand and pneumatic tools, and a figure modeling area which provides quality space and light for anatomic modeling. The ceramics studio offers opportunities for hand building, mold making, and wheel thrown work. Both utilitarian and sculptural aspects are explored. The studios are equipped with kickwheels, gas, electric and raku kilns. The woodworking and furniture design studio has a well equipped shop in which the broadest range of techniques is pursued. A full complement of hand and power tools is augmented by facilities for clamping and gluing, bending, forming, and finishing wood. The furniture program includes Arts 725 Wood Multiples, which prepares students to enter such events as the biennial National Students Furniture Design Competition. UNH has had several prizewinners in recent years. The University offers an approved art education program that is organized into a five-year teacher education sequence. This curriculum is designed to prepare teachers of art in the public schools. The satisfactory completion of the B.A. Studio Art curriculum for art education students (note: which differs slightly from the B.A. Studio Art curriculum) and required education courses, in conjunction with the fifth-year internship, will satisfy the initial certification requirements for teachers of art in the public schools of New Hampshire and in most other states. Art education students may take accredited crafts courses at other institutions as art electives. Students considering the art education program should consult the UNH Undergraduate Catalog under the heading "Preparing for Teaching."